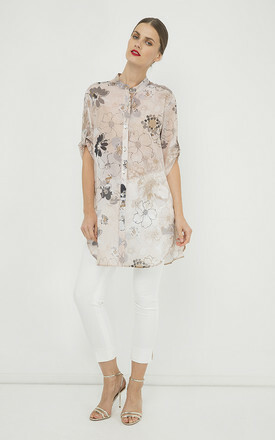 Long summer shirt in print fabric, 100% cotton poplin. ¾ sleeves which can be rolled up and fastened with the tab and button on the sleeve. Upright 3cm collar. 3cm wide placket in the front, 100% cotton. Fastens with decorative shell buttons. Rounded uneven hemline, 5 cm longer in the back. High side slits, 20cm. Subtle A line silhouette.